The Avid Reader is happy to present local author Kim Stanley Robinson for the launch of his newest science-fiction novel, Aurora on July 17th from 7:30pm to 8:30pm. Freya and her parents live aboard a starship that has traveled for generations and will soon reach Tau Ceti, a star about 12 light years from Earth’s solar system. Freya’s mother, Devi, is the de facto chief engineer, struggling to keep the ship’s environment balanced until they reach a new world and, they hope, survive on it. But ecologies are delicate, resources are limited, and the laws of physics are immutable. Over the course of Freya’s life, her community faces genuinely surprising struggles for survival, leading Freya to wonder whether it is too late to reconsider a question initially decided millions of miles away and centuries ago: should this ship have been launched in the first place? 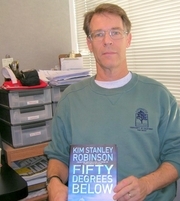 About the Author: Kim Stanley Robinson is a New York Times bestseller and winner of the Hugo, Nebula, and Locus awards. He is the author of more than twenty books, including the bestselling Mars trilogy and the critically acclaimed Forty Signs of Rain, The Years of Rice and Salt and 2312. In 2008, he was named a "Hero of the Environment" by Time magazine, and he works with the Sierra Nevada Research Institute. He lives in Davis, California. WisCon is the first and foremost feminist science fiction convention in the world. WisCon encourages discussion, debate and extrapolation of ideas relating to feminism, gender, race and class. WisCon honors writers, editors and artists whose work explores these themes and whose voices have opened new dimensions and territory in these issues. And, oh yes, we also like to have fun while we're at it. Local award winning author Kim Stanley Robinson returns to the Avid Reader to discuss his newest book Shaman. "Kim Stanley Robinson, the New York Times bestselling author of science fiction masterworks such as the Mars trilogy and 2312, has, on many occasions, imagined our future. Now, in Shaman, he brings our past to life as never before." There is Thorn, a Shaman himself. He lives to pass down his wisdom and his stories -- to teach those who would follow in his footsteps. And then there is Loon, the next Shaman, who is determined to find his own path. But in a world so treacherous, that journey is never simple -- and where it may lead is never certain. Shaman "is a powerful, thrilling and heartbreaking story of one young man's journey into adulthood -- and an awe-inspiring vision of how we lived thirty thousand years ago." Renowned author of near-future SF Kim Stanley Robinson shifts to the past with his latest work, Shaman. Set in the ice age, Shaman focuses on the people who made the paintings in the Chauvet-Pont-d’Arc Cave in southern France, about 32,000 years ago. He has spent time in Antarctica and does a lot of snow camping in the Sierra, so he should be an expert at keeping us cool and entertained on a hot summer night. Join us as Stan and his Shaman bring our past to life as never before. Also signing in Redondo Beach on May 24th. Please join us as Kim Stanley Robinson, the "writer whose work will set the standard for science fiction in the future", discusses his new book 2312. Also signing in San Diego on May 29th. Jeff Carlson, Ellen Klages, and Kim Stanley Robinson make a special appearance at the Martha Riley Community Library for a night of science fiction! Kim Stanley Robinson is currently considered a "single author." If one or more works are by a distinct, homonymous authors, go ahead and split the author. Kim Stanley Robinson is composed of 15 names. You can examine and separate out names.